Migrants wait to be be rescued by Acehnese fishermen on their boat on the sea off East Aceh, Indonesia, Wednesday. Pic: AP. 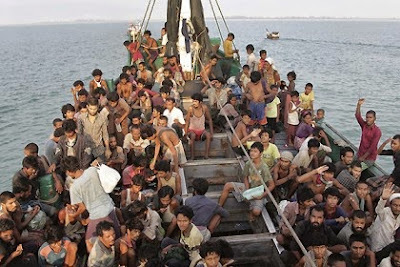 The Rohingya are homeless, stateless victims; and ASEAN is responsible. There’s nothing confusing about that, Professor. The sophistry of politicians in the face of the Rohingya crisis is astounding. It mainly consists of reality-denial, blame-shifting and creative word play. Now, one Singapore academic has joined in the fray with a supposedly insightful commentary that is really a tragic failure in discursive analysis and a veiled attempt to justify half-hearted responses to the crisis. Farish A. Noor, an associate professor at the S. Rajaratnam School of International Studies in Nanyang Technological University, authored the rather misleading titled opinion piece, “Give dignity back to the Rohingya”. It was published in the Straits Times yesterday. In it, Farish disingenuously calls for honesty while simultaneously denying the severity and scale of the Rohingya problem. He does this repeatedly to establish two arguments: First, that over-emphasising the victimhood of the Rohingya reduces them to the status of perpetual victims. Second, that primary responsibility lies with the right-wing ethno-nationalists and sectarian groups in Burma, not ASEAN. Well-intentioned as he may be, Fariah relies on faulty logic and false assumptions that in effect encourage the dehumanisation of the Rohingya and the denial of ASEAN’s responsibility. To describe the Rohingya as “homeless” obfuscates the fact that they have a home, or rather had a home, and that they have been forced to leave as a result of a domestic political crisis that likewise involves actors and agents who are local. It is both contradictory and plainly false. And if there is anything that is confusing, it is statements like these. Farish says two things that cannot both be true at the same time. He says the Rohingya both have a home and don’t have a home. But either they don’t, in which case they are homeless, or they do, in which case they are not homeless. They can’t both be homeless and have a home at the same time. Or perhaps we should read it as an equivocation, not a contradiction. In the first instance, he may be saying they “have a home” in the sense that they belong to a state. In the second instance, he may be saying they “had a home” in the sense that they used to live in a house somewhere in the Rakhine State in Burma but now can no longer live there. But this doesn’t help. His statement is either contradictory or meaningless because of its equivocation. And even if we were somehow to accept it, it is still plainly false. The Rohingya are not recognised as citizens by the Burmese government and are not granted the rights and protections that all other Burmese have. How then can we say they do “have a home” in the sense that they belong to a state? So the Rohingya are indeed homeless and we are right to insist on it. To do so is not to obfuscate the issue, as Farish charges; it is simply to say things as they are. Many of the Rohingya are homeless. They are not recognised by the state and they have been displaced from their homes. This is nonsense. The Rohingya are a stateless community with no homeland of their own—the United Nations High Commissioner for Refugees (UNHCR) designates them as a stateless people. They ought to be recognised by the Burmese government and they ought to have a homeland, but they aren’t and they don’t. This isn’t the perpetuation of false information; it is insistence on the truth. Only Farish is confused here because he conflates is with ought. To say the Rohingya are homeless is not to “deny them their history, culture and identity” either. On the contrary, it is to insist on it. By conferring on them the status of refugees, we recognise that they are a defined social group that is being persecuted on the basis of some innate characteristic of that grouping. This forces us to recognise the uniqueness of their history, culture and identity, not deny it. Journalists have done an admirable job in capturing the vulnerability and suffering of the Rohingya in pictures and video. The effect of this has been an outpouring of expressions of sympathy and it has galvanised people all around world and the region into pressuring their governments to do something about this crisis. But we should also be wary of over-emphasising the victimhood of the Rohingya, or casting them permanently in the role of the unfortunate and vulnerable, for such discourses of victimhood – when overplayed – can also hobble the Other and reduce others to the status of the perpetual victim. Farish is not wrong about recognising their courage; the problem is that he mistakes concern for condescension, attention for stereotyping. First, to be concerned about the Rohingya’s plight is to think of them as equals, worthy of the same protection as any other human being, not as inferiors. No truly condescending person would take a genuine interest in the fate of others, much less act to help those he deems inferior. Second, to pay close attention to the Rohingya’s plight is to recognise how difficult it is for them to escape their situation, it is not to stereotype them as automatons. The Rohingya are indeed perpetual victims with nowhere to run to—not Burma, Bangladesh or ASEAN. Focusing on their tragic plight forces us to recognise them as persons like ourselves and prevents us from seeing them as just another statistic. For many of them, their time in a vessel has indeed been such a traumatic experience that we may say it will define much of their identity and their existence. They are victims and there is nothing wrong with emphasising it. Doing so does not detract from their humanity, it adds to our recognition of it. Farish seems to suggest that we celebrate their courage in the midst of a tragedy. But what is there to celebrate? Their “strength and enduring will to survive at all costs” is desperation, not the triumph of the human spirit. What is happening now in South-east Asia and the Mediterranean is not a natural disaster though, but rather the result of political will and contestation that necessarily involve human agency, and thus entails the element of moral-political responsibility as well. Farish thus claims that the Rohingya crisis isn’t a disaster because it isn’t a natural disaster. Or in other words, it shouldn’t be described as a “disaster” because it is “the outcome of a political crisis that has been brewing for years now”, not an earthquake or tsunami. This is a rather odd claim to make. A man-made disaster is a disaster nonetheless, and commentators typically have in mind the scale and severity of the crisis when they use the word “disaster”, not its causes or its inevitability. So why does Farish make this contorted claim? I think he does so to subtly explain why the principle of non-interference is important. He draws a parallel to the crisis in Libya and calls it is the “outcome of political intervention gone wrong”. But the problem here is not that ASEAN has intervened and created the crisis; it is that it has done nothing. It boggles my mind how anyone might see the Rohingya crisis as proof that ASEAN’s principle of non-interference works. The Rohingya crisis is an ongoing disaster. It is ASEAN’s disaster. Farish criticises the “tendency to label this as an ‘Asean problem’” because it misleadingly suggests that “all of South-east Asia was implicated in the humanitarian crisis that led to this situation.” He says the right-wing ethno-nationalists and sectarian groups in Burma are the ones who are “primarily responsible” while other countries in ASEAN have merely been “slow in their response to the flight of the Rohingya”. None of them is directly responsible, he claims. It is not at all clear what Farish prefers, but surely the alternative is not to see this as a “Burma problem”. The Rohingya asylum seekers on rickety boats are not in Burma’s waters, they are in the waters of ASEAN member states like Indonesia, Malaysia and Thailand. Whose responsibility is it to save them from drowning or dying of starvation if not theirs? There is no way Southeast Asia can avoid being implicated in this crisis—they already are by virtue of geography. Unless ASEAN decides to wash its hands of the matter, it is very much an ASEAN problem. There is also no meaningful distinction to be drawn between direct or primary responsibility and indirect or secondary responsibility in this context. ASEAN may not have held the whip but they certainly put it in Burma’s hands; or at the very least, they knew about it and did nothing. ASEAN may not have started the racism but they have certainly done virtually nothing to stop it. Crying “he pushed me first” may work for six-year-olds but not on the world stage. It is very much ASEAN’s problem; there’s no point in denying our culpability. We may quibble about the extent of ASEAN’s responsibility, or the manner of it, but we cannot deny that ASEAN isresponsible for this crisis. This doesn’t mean we ignore Burma’s central role in causing this crisis. On the contrary, it means developing the political will to cooperate with it in implementing long term solutions. I do not fault Farish’s sincerity, merely his muddle-headedness. He is right to be concerned about the Rohingya’s dignity. However, he is wrong to think that the dignity of recognising individual autonomy is more important than the indignity of death, starvation and malnutrition. Rather than try to affirm their inherent dignity with tortured logic, we should simply recognise it by acknowledging that they are indeed homeless victims who need ASEAN’s help.